Long considered "the noblest of the senses," vision has increasingly come under critical scrutiny by a wide range of thinkers who question its dominance in Western culture. These critics of vision, especially prominent in twentieth-century France, have challenged its allegedly superior capacity to provide access to the world. They have also criticized its supposed complicity with political and social oppression through the promulgation of spectacle and surveillance. Martin Jay turns to this discourse surrounding vision and explores its often contradictory implications in the work of such influential figures as Jean-Paul Sartre, Maurice Merleau-Ponty, Michel Foucault, Jacques Lacan, Louis Althusser, Guy Debord, Luce Irigaray, Emmanuel Levinas, and Jacques Derrida. Jay begins with a discussion of the theory of vision from Plato to Descartes, then considers its role in the French Enlightenment before turning to its status in the culture of modernity. From consideration of French Impressionism to analysis of Georges Bataille and the Surrealists, Roland Barthes's writings on photography, and the film theory of Christian Metz, Jay provides lucid and fair-minded accounts of thinkers and ideas widely known for their difficulty. His book examines the myriad links between the interrogation of vision and the pervasive antihumanist, antimodernist, and counter-enlightenment tenor of much recent French thought. Refusing, however, to defend the dominant visual order, he calls instead for a plurality of "scopic regimes." 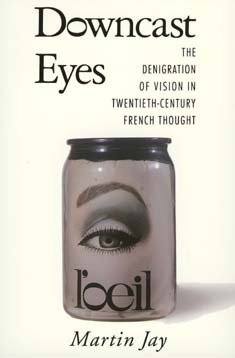 Certain to generate controversy and discussion throughout the humanities and social sciences, Downcast Eyes will consolidate Jay's reputation as one of today's premier cultural and intellectual historians. Martin Jay is Sidney Hellman Ehrman Professor of History at the University of California, Berkeley. His books include Force Fields (1992), Marxism and Totality (California, 1984), Adorno (1984), and The Dialectical Imagination (1973).